The practice of Yoga has established itself and survived over thousands of years; it deals with the union of mind, body & soul with the universal energy. In the recent past there have been articles published that the practice of Yoga is causing injuries thereby building fear towards Yoga practice in the community. I am yet to come across articles that dissuade public from driving cars cause they lead to accidents or travel in flights cause they crash sometimes. In a recent TV episode of Mahabharata one dialogue by Shakuni Mama made loads of sense “its easy to do adharma on people who follow dharma”. These articles reflect the same bad spirit. The practice of Yoga involves eight stages: Yam, Niyam, Asana, Pranayama, Pratyahaar, Dhyan, Dharan and Samadhi. These have been listed in this order with sufficient reason. The very first stage addressed in Yam is that of Ahimsa or Non-violence. It says that one needs to respect every aspect of our life around us including ourselves and our bodies. This spirit of non-violence has to reflect in all our further stages of Yoga practice whether its physical, mental or spiritual. Often these crucial stages of Yam and Niyam are ignored or are not properly understood and absorbed in Yoga practice. If the foundation is not strong the practice further will be faulty. “Yoga causes injury” also is a classic reflection of the human ego which looks for possible reasons outside to blame for their misery. 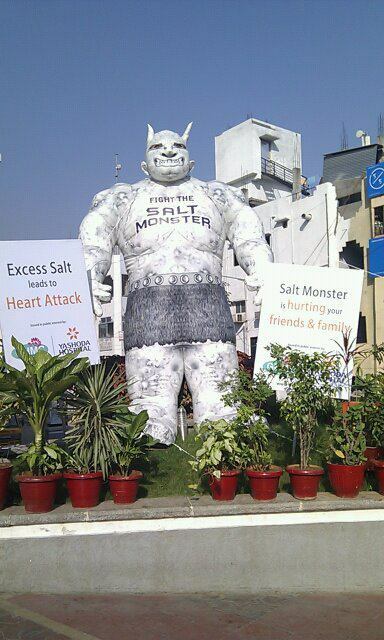 Recently I saw a huge inflatable outside a hospital with salt in the form of a monster and the supporting line said “Salt monster is hurting your friends and family” which made me wonder if Salt was the monster? or are we humans the monsters that are over consuming salt. Its convenient to put blame on others. When we practice Yoga asanas in a group class we start comparing our practice thereby feeling insecure if someone around is better or it feeds our ego if we are the best. But the critical element to understand here is that each individual is unique and the picture perfect postures may not be perfect for each one of us. In short, when we fail to respect the practice and come to class with the attitude of demonstration & showcasing to others how perfect we are, we land up in the trouble zone. Our desires to get into advance postures too early is also the culprit. Sometimes the ego of our Yoga instructor could also land us into trouble if he/she pushes us beyond our limit to showcase their capabilities. Its good to remember that we need to prepare our body, modify our lifestyles and stay committed to asana practice to get to advanced asanas. More importantly, Yoga is an inner journey and asana practice is one element that helps us move further. An individual with a short hamstring is equally qualified to be a Yogi as much as a practitioner with long hamstring who can reach his head to the shins in a forward bend. The important aspect is to develop inner silence. Our body communicates with us and guides us provided we are willing to keep our desires & ego in check to listen to it. One piece of advice that I always keep with myself during my practice came from a dear friend and a senior Yoga teacher Paul Fox of UK who said “Follow your inner Guru”. So very true.